Married Life deals with just that, the life of married people. Harry Allen (Chris Cooper) and Pat Allen (Patricia Clarkson) seem to be a happily married couple. However, one thing is wrong, Pat cannot provide Harry will the level of emotional attachment he needs. Harry is a true romantic and even though he loves Pat, he knows something is missing. Harry finds what he is missing in Kay Nesbitt (Rachel McAdams) and experiences the kind of love that he wants for the rest of his life. Harry determined to leave Pat confines his predicament in his best friend Richard Langley (Pierce Brosnan). Richard gives Harry friendly advice until he meets Kay and even though he has never been the kind of guy to go with just one girl he instantly falls in love with Kay. Meanwhile, Harry not knowing how to break the news to his wife, that he is leaving her, decides to poison her. While Richard begins to romance Kay, he obtains information that can set both Harry and Pat free, but decides that his happiness is more important. Everybody already knows that married life isn’t always bliss and his movie does an amazing job depicting those circumstances. The movie, set in the 40s is a nice depiction of the time. Chris Cooper who usually plays the creepy silent roles is excellent and brings some of the creepiness to the table he too. Pierce Brosnan, who oozes charisma, also does an excellent job. The rest of the cast, Patricia Clarkson and Rachel McAdams, also deliver top notch performances. 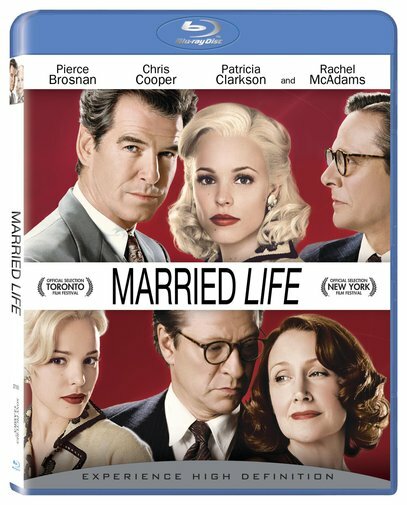 Sony Picture Classics had done an amazing job with Blu-ray disk for Married Life. The movie had vivid colors and not one artifact can be found. The disk also includes three alternate endings. The only bad thing is that they didn’t include a behind the scenes, but the alternate endings are interesting enough. The first alternate ending is very strange and I’m glad they didn’t go with it. In it Harry accidentally crashes his car and his wife dies. At the hospital Harry asks Richard to kill him with the poison, and Richard is shown in court testifying to what he did. The second alternate ending is almost the same as the first except that Richard is shown narrating the story and not testifying in court. The third alternate ending is much less somber than the previous two. In the third alternate ending, Harry doesn‘t crash and the movie ends with his wife‘s head on his shoulder and Harry smiling. Of all the ending, I prefer the one they went with.